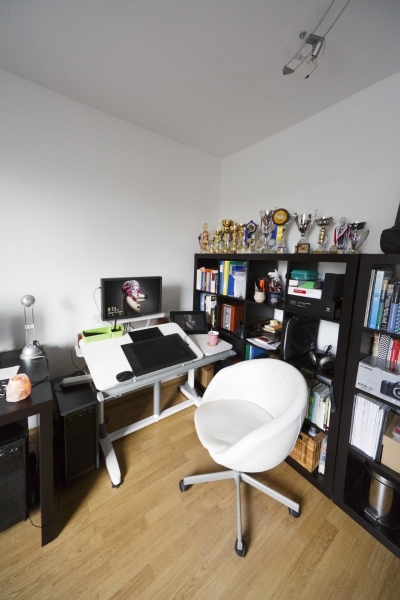 I never really cared about my workspace, I always used available table or bought a cheap one at Ikea store. Yep, it was fine as long as I was doing photos as a hobby but when I went pro, I realized it´s no longer acceptable. Having a migraines from blocked spine and hands in pain were awful. And luckily, after I bought Wacom Cintiq Companion, I got an idea! It has a stand! Wow, I got it! I need table with adjustable height and desk! It was the best idea ever since. I am short so every normal table is too high for me. When I worked with Wacom tablet, I always had my forearm laying on table. That caused me a carpal tunnel inflammation. I spent few months out of retouching. It was so depressive! I tried to work with my left arm, with my hand above desk, not touching the table. I tried everything imaginable but it was not satisfying. When I got idea about these so called “growing tables” I found an instant solution. These tables are not really cheap, some of them are really expensive, but I found a reasonable type with acceptable price – Amadeus Rolland II – I asked for custom color (just white and grey) so I had to wait aprox. a month. In a moment I got it I knew I did the best I could. I have a spare space for coffee, writing tools and most importantely nothing hurts anymore. 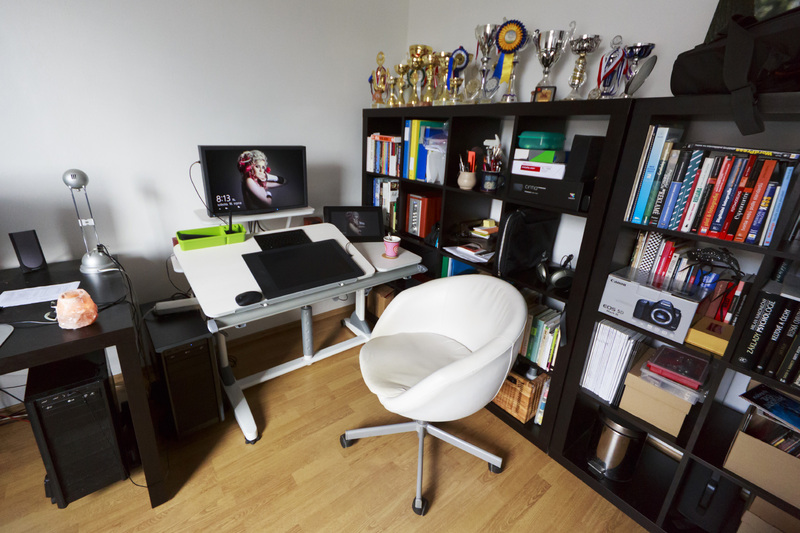 Adjustable height and angle of your desk is the best you can do for your health. If you have a chance, get growing table. They say it´s for kids but it´s same good for you as for them :). Now I adjust angle by type of action I am doing and after few months I can only say this table was worth every cent. Still need to buy a good chair. I got reccomendations for Spinalis chairs. I will test it before I buy it. Hope my expectations ain´t too high. If anyone of you has it, I would be happy if you let me know what you think of it. I occasionally sit on fit ball but it´s not suitable for long work. If you have another tip, please share it with me. 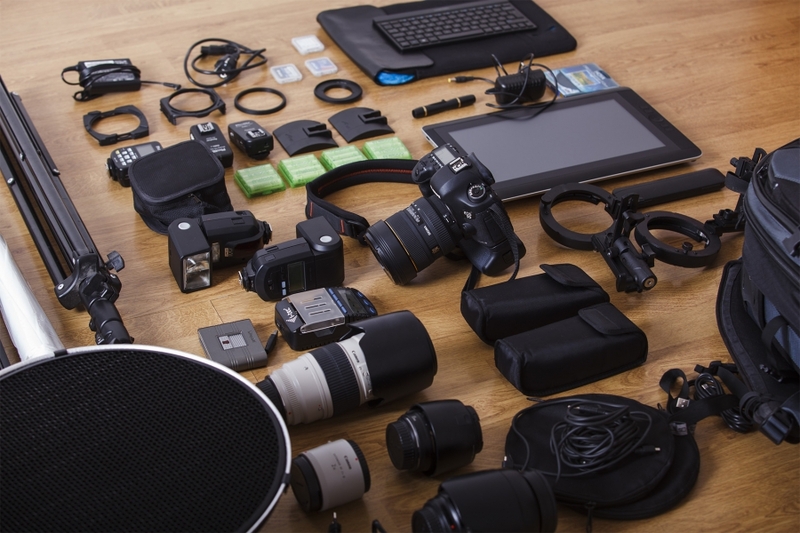 Same important as your workspace is your travelling kit. 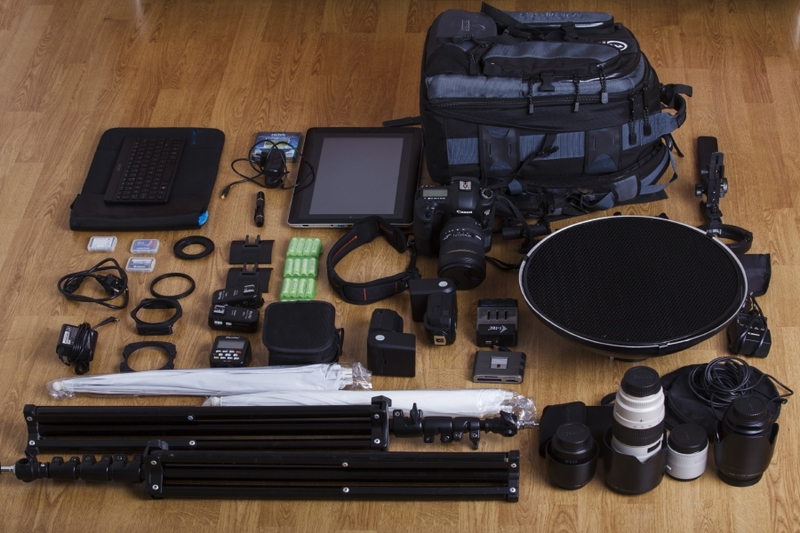 Basic travelling kit should contain everything you need to do your job. Usually zoom lenses and system strobes saves your space and time. Especially if you travel quite often. Situation is getting even worse when you can´t use a car or have a long walk to your photoshoot destination. I try to be as lightweight as possible. I rarely use tripod on location (unless it´s a night photo or I have another specific reason) but I learned that heavy Manfrotto head and heavy tripod is not the best for travelling. Another very important thing is storage bag. It should take in all of your important gear plus notebook or tablet for seeing photos on location, later proofing and editing. When I travel, I usually cover focal lenght 12-200mm which works for 99% commercial photoshoots. If I take a portrait photos, I take prime 85mm lens and if animals, I add teleconvertor and 180mm macro into my bag. I carry one or two bodies. Depends if backup is really necessary. Ad some basic filters – circular polarizer should be in a bag always, sometimes I take various ND filters and mount. Sometimes I carry studio lights and sometimes system Metz strobes are better solution. Backup batteries and chargers are always with me. When I use system flashes, I carry Phottix Odin remote and recievers. Lens pen for lens cleaning, bunch of CF cards, card reader, cables when needed, Wacom Cintiq, some light modifiers (softbox, dish, umbrella,…), lightweight tripods, sometimes speedlite holder with Bowens mount. And this is pretty much all. Do we really need to carry everything? Well, no… I can reccomend it for weddings or when doing more photoshoots. I usually take three lenses with me and lights only when needed. Sometimes reflector works same well. But I usually get more and more ideas during photo session so I like to be prepared for more. Of course it means more stuff and heavier luggage. I cannot reccomend heavy cases or bags (like exactly that one on image above). Do not get me wrong, this heavy stuff, like heads, tripods, etc. has it´s own place – in studio. But why would you need 3,5kg tripod and head that can carry 32kgs on location when your camera with grip, two batteries and telephoto lens is roughly around 3kg. Be smart and choose wisely what you carry with you! Walking 10km uphill with tele lens if you go shoot lanscape photography is a bit non sense and you waste a lot of your energy that you will need for your photoshoot :). Carry as less as you can but always be prepared. More memory cards, additional battery is better than forgetting your battery on charger at home. It happened to me before, believe me and I wasn´t happy that I had to go back to pick it up.